Art Tutor Robert Dutton works tirelessly behind the scenes not only promoting his own courses, which take place in several locations other than Higham, but also recording what has gone on so both previous and prospective students can get a feel for what goes on. 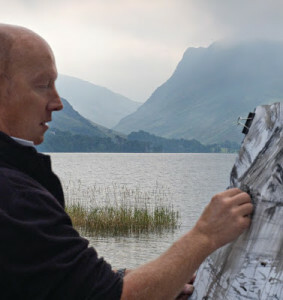 Robert is one of our Tutors who put so much energy into the experiences they provide, and EXPRESSIVE LANDSCAPES are a perfect channel for his enthusiasm and insight. One of his USPs is taking groups out to feel first hand the drama of the surroundings. What results is artwork that, even if it is finished back in the studio, reflects the dynamism of the outdoors, with light and wind both having a bearing on the style of painting that emerges. Those who have tried Robert’s courses elsewhere tell us they appreciate the difference each setting provides, and Higham is blessed with some of the most stunning scenery and landscape features. A picture painted in Yorkshire will always have a different flavour to one painted by the same artist round here … that’s where doing it “en plein air” really makes a difference. Robert provides regular insights into his own work and the work of his wide variety of students, making his a two-legged, one-headed learning machine. It is nice to have an approach such as Robert’s, which, in a way, is as expressive as his artwork, contrasting with other, equally meritorious approaches from our many other hand-picked Tutors. Here’s an example of Robert’s reporting on his recent September course.